1. Climate change is an extraordinary challenge facing the world community, fuelled by a mix of continuing increases in anthropogenic greenhouse gas emissions and environmental feedback loops that threaten uncontrollable change. 2. The solution paths are largely understood: a rapid global shift from emission-producing to clean-energy generation; energy efficiency measures to buy time until that shift can be completed; and sequestering carbon through agriculture, forestry and other measures. A recent International Energy Authority report estimated that US$10.5 trillion will be required in the coming two decades to fund the transition to a low-carbon economy, at a pace rapid enough to head off run-away climate change. A major report issued by WWF corroborated that figure. That would only require an investment equivalent to 1.5 % a year of the world’s institutional investment fund assets, every year for just 10 years. Urgency – the critical constraint on avoiding a 2°C warming will be the time taken to develop and deploy the industries of the low-carbon economy. The Catch 22 of low-carbon industrial development – many zero and low-emission commodities are currently low-volume and therefore high-cost. They will naturally increase in volume and decrease in cost – even to the point of being cheaper than fossil fuels (as has already occurred with solar hot water, biomass and wind power in several countries). But the urgency means that this process has to be short-circuited so that high volumes are developed and deployed even at high cost, with an accelerated transition to low cost occurring as a result. Developing countries are where the climate challenge will be won or lost, but the deployment of high-cost, low-carbon solutions represents a potentially unreasonable opportunity cost compared to short-term poverty eradication, and a competitive disadvantage to third-party funders. 4. The urgent need for deployment can be addressed by mechanisms that: (a) develop a suite of critical low-carbon industries in parallel, (b) establish annual growth rates for low-carbon industries that average 25% per year until 20% of resource capacities harnessed and (c) are in place and growing in key jurisdictions by 2014. 5. The volumes of investment required are large – more than $10 trillion at up to $1 trillion per year. Bonds allow us to borrow against future economic benefits to allow for the investment needed now to deliver those benefits. The global bond market reached a level of $83 trillion in 2008, according to IFSL Research. Climate bonds could be issued each year up to a level of $0.5 trillion for 20 years and still not exhaust the capacity of the global market. The past 200 years have seen numerous successful national initiatives to build infrastructure to meet environmental or social challenges: the vast sewer construction projects of the 19th and early 20th centuries that removed the spectre of cholera in Europe; the building of national energy grids to power the 20th century’s economic booms; the building of hospitals as the foundation of modern health systems. Much of this effort was financed by the issuing of bonds – long-term debt repayable at pre-agreed rates, guaranteed by governments. Short-term price support for renewable energy technologies to achieve economies of scale will result in long term cost savings. Climate bonds are infrastructure bonds tailored specifically for financing climate solutions. Build renewable energy generation and its enabling infrastructure. Widely implement energy efficiency measures in cities and industries. Support adaptation measures that will boost the economic development of communities in the face of climate change. There is more than enough private capital in the world to fund the necessary transition. The capacity of government to directly fund the transition to a low-carbon economy from current revenues (taxation) is limited. But, with some US$120 trillion of institutional funds under management plus retail investor and corporate funds, adequate capital resources exist. The scale of investment required will demand a constructive partnership with long-term investors, who manage the larger bulk of the world’s deployable capital. This can be seen as a new partnership between private capital and governments. 6. Institutional investors will invest in long-term Climate Bonds given adequate and secure returns. Pension funds, for example, understand the importance of supporting the shift to a low-carbon economy. But they also have to ensure secure returns for their members. Long-term bonds are well suited to both the financing of long-payback energy projects and to providing pension funds with security of returns over the longer term. For investors, Climate Bonds will simply be investments in new Fixed-interest opportunities, packaged to be more attractive than many existing options. Given the scale of likely offerings, they can be expected to become a new asset class. Because Climate Bonds will be novel, and because of the large scale of issuing required, government contingency guarantees or political risk insurance will be essential. While capital may be available, the challenge is in constructing opportunities for that capital that will allow investors to meet their obligations while funding the essential low-energy transformation. 7. The trajectory of renewable energy generation costs is downward, and has been for the past 20 years. Generation costs will continue to decline, eventually being lower than fossil-fuel energy costs, particularly if aided by the economies of scale of large-scale developments. Volume will drive price competitiveness with fossil fuel generation. Bonds can be used to borrow against longer-term cost reductions and pay for the scale of investment required in the immediate future. 8. Investibility will be enhanced by using accelerated economies of scale to bring forward cost savings from declining renewable energy prices or from reduced energy consumption, then capturing the difference between business-as-usual costs (i.e. fossil-fuel-based electricity costs) and converting those savings into long-term revenue streams used to repay investors. The investibility of specific initiatives will depend on delivering secure, long-term returns at competitive levels of risk, rather than on values arguments. Investibility for long-term investors will also involve the aggregation of individual low-carbon economy initiatives into larger scale opportunities for investment. It will require a close engagement between government, investors and industry. 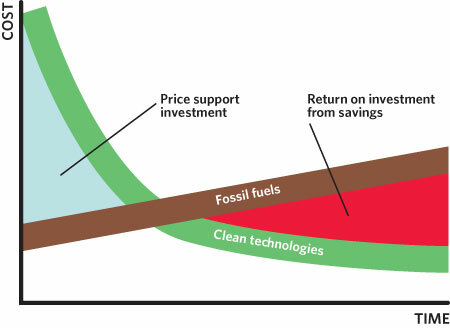 The investments required to address climate change can be profitable – for investors, for companies involved, and for national economies stimulated by capital spending and clean-energy innovation. Climate Bonds can help keep the planet inhabitable for billions of humans while funding our pensions. 9. The transition to a low-carbon economy presents capital with what is likely to become the largest commercial opportunity of our time: investing in clean energy and low-carbon infrastructure. 10. Achieving the scale and speed of development needed will require an active enabling role on the part of governments, at all levels. The low-carbon industry segments that need to grow to avoid tipping points and models their individual contributions. 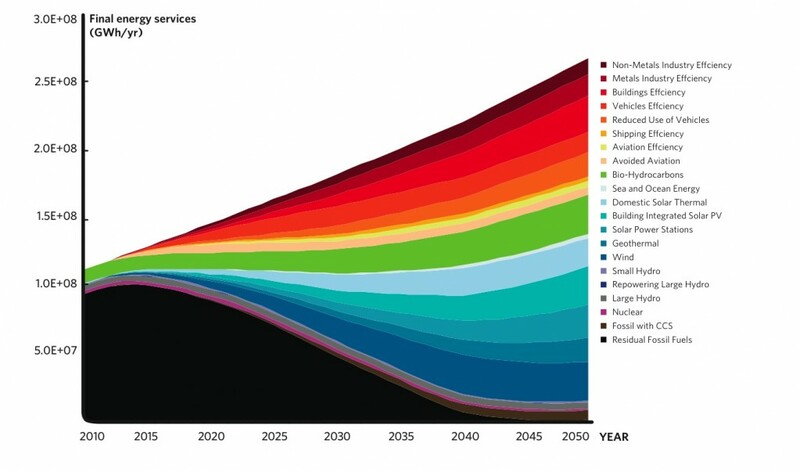 The upward limit of average, global growth rates for the various industry segments is 30%; on that basis we have to see all (not just a few) low carbon industry segments growing at maximum rates by about 2014 to avoid 2 degrees. The sooner rapid growth starts the shallower the trajectory needs to be. The diagram is from the WWF Climate Solutions II report. September 2009 by Climate Risk Ltd.
 International Financial Services London 2008.